A vaccine should be a matter of free and informed choice. Neither conventional medicine (conmed) vaccine nor homeopathic immunisation guarantees 100% protection. The level of immuization provided by homeopathic system is less than that provided by alloapthic vaccines in most cases and is equal to for some disease conditions. Public challenge and petition to Dr Paul Offit who said "Baby immune system can handle as many as 10,000 vaccines"
What US President Donald Trump said on vaccines? All ConMed vaccines are scheduled-2 poisons, says FDA. UK: Vaccine Damage Payment: Compensation if disability is 60% or more. That means both ears must go deaf to get compensation. 2. Make sure the vaccine you are taking is not genetically engineered or modified. 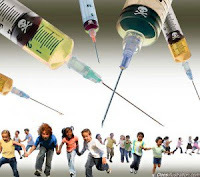 GSK and Serum Institute's Hepatitis B vaccine and Merck's MMR II is genetically engineered. If you are concerned if your vaccine is genetically modified, check this. 3. If a research says MMR vaccine increases the risk of autism and meningitis, don't take the vaccine. Needle-free oral homeopathic immunisation is safe. Good articles and liks. thank you nancy malik.